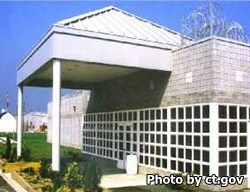 Robinson Correctional Institution is located in Enfield Connecticut. It is a level 3 facility, which means it houses medium security offenders. Robinson houses almost 100 pre-trial inmates, with a total capacity of approximately 1,450 offenders. Inmates at this facility can participate in vocational programs to develop culinary arts skills, machine tooling, and engine repair. Inmates can also take educational courses through the community college. Treatment programs include substance abuse treatment and offender reprogramming. You must fill out a visitors application and have it approved before you visit. This institution uses a rotating schedule based on the first letters of the inmates last name. You can view the visiting schedule here.